Humphrey Bogart: it’s hard to think of anyone who’s had the same lasting impact on the culture of movies. Though he died at the young age of fifty-seven more than half a century ago, his influence among actors and filmmakers, and his enduring appeal for film lovers around the world, remains as strong as ever. What is it about Bogart, with his unconventional looks and noticeable speech impediment, that has captured our collective imagination for so long? In this definitive biography, Stefan Kanfer answers that question, along the way illuminating the private man Bogart was and shining the spotlight on some of the greatest performances ever captured on celluloid. Bogart fell into show business almost by accident and worked for nearly twenty years before becoming the star we know today. Born into a life of wealth and privilege in turn-of-the-century New York, Bogart was a troublemaker throughout his youth, getting kicked out of prep school and running away to join the navy at the age of nineteen. After a short, undistinguished stint at sea, Bogart spent his early twenties drifting aimlessly from one ill-fitting career to another, until, through a childhood friend, he got his first theater job. Working first as a stagehand and then, reluctantly, as a bit-part player, Bogart cut his teeth in one forgettable role after another. 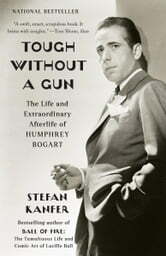 But it was here he began to develop a work ethic; deciding that there were “two kinds of men: professionals and bums,” Bogart, for the first time in his life, wanted to be the former. After the Crash of ’29, Bogart headed west to try his luck in Hollywood. That luck was scarce, and he slogged through more than thirty B-movie roles before his drinking buddy John Huston wrote him a part that would change everything; with High Sierra, Bogart finally broke through at the age of forty—being a pro had paid off. What followed was a string of movies we have come to know as the most beloved classics of American cinema: The Maltese Falcon, Casablanca, The Big Sleep, The African Queen . . . the list goes on and on. Kanfer appraises each of the films with an unfailing critical eye, weaving in lively accounts of behind-the-scenes fun and friendships, including, of course, the great love story of Bogart and Bacall. What emerges in these pages is the portrait of a great Hollywood life, and the final word on why there can only ever be one Bogie.